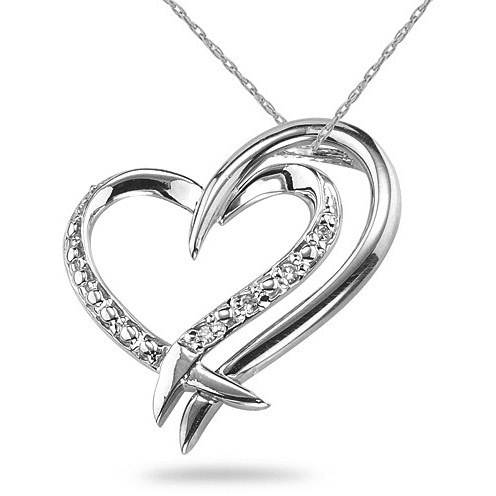 2 hearts connect as 1 in this fashionably designed diamond heart necklace in pure .925 sterling silver, from Apples of Gold Jewelry. The heart necklace is set with a total of 4 white diamonds weighing 0.02 carats. The setting gives the appearance of more diamonds along the inner heart. Includes a matching silver chain in 18". This pendant is also available in 14k white or two-tone gold, shown below. We guarantee our 2 Hearts Connect As 1 Diamond Necklace in Sterling Silver to be high quality, authentic jewelry, as described above.